In the face of growing attacks from wealthy special interests and billionaires, union members and their allies held Labor Day weekend celebrations of the vital contributions workers make to life in Central Valley, Central Coast, and Silicon Valley. 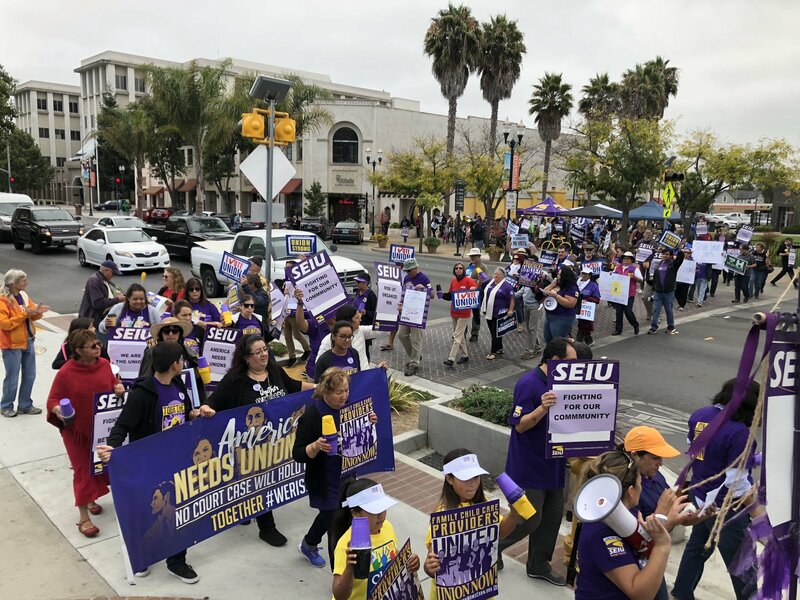 Four Labor Day events and marches were organized by SEIU Local 521 in North Central California with allies at a time when workers across the country are rising up against anti-union politicians and policies. According to a recent study by the UC Berkeley Labor Center, our unions help improve the wages and benefits of all workers in California – both union and nonunion – as well as help address racial and gender inequality. On average, California’s union women earn 26% more than nonunion women. Similarly, Black workers earn 19% more and Latino/a workers earn 40% more on average under a union contract. Labor Day 2018 was an incredible display of unity across our local as SEIU 521 union members, family childcare providers, community leaders, and elected officials came together to celebrate the victories and history of the labor movement. The Labor Day BBQ & Solidarity March in Bakersfield drew nearly 500 community members from 22 different unions across Kern County that came together and highlighted the victories of the labor movement. The celebration included a march and rally that energized the crowd of county and hospital workers, families and community leaders. There were various community resources booths along with a voter registration booth. Fresno Family Child Care Providers, along with members of SEIU 1000, SEIU 2015, SEIU 521, and Mi Familia Vota joined together at Court House Park in Fresno on Labor Day to demonstrate the power of unity in the face of attacks on working families. We honored the victories and rights gained through the labor movement of our past while vowing to stick together for the good, union jobs America needs. Our Labor Day rally in Fresno included City of Selma Mayor Jim Avalos, Tulare County Board of Supervisor Eddie Valero, Assembly Woman Anna Caballero, Candidate for State Senate District 12, and Andrew Janz, Candidate for Congressional District 22. The celebration in San Jose on Saturday, September 1st, included voter registration and speeches that energized the crowd of county workers, child care providers, fast food workers, and community leaders. “Union workers are public servants, transportation workers, healthcare and behavioral health specialists, private-sector workers, child care providers, school workers, and more. Silicon Valley is a better place to live, work, and raise a family because of the difference our unions make in this community. But that’s not all. At a time when some seek to divide us, we lift all workers up, so that we can provide better lives for our families, whether Black, white, or brown. That’s why we have reclaimed Labor Day as our holiday. Today, we celebrate the victories and history of the labor movement, while especially recognizing the contributions our unions make right here in Silicon Valley,” said SEIU 521 Secretary and Santa Clara County Worker Mullissa Willette. Family child care providers were joined by fast-food workers who lead the successful Fight For $15 campaign to speak about their common fight to have a union and the right to collectively bargain. “As a Family Child Care Provider fighting for our rights to advocate for our own livelihoods and quality early education, I am proud to see my fellow union brothers and sisters stand beside us today. We know the strength of unions in action, particularly for working women and mothers like us. We know that Silicon Valley and America need unions,” said San Jose Family Child Care Provider Patricia Moran (Fifth in the photo, from right to left). Elected officials including Ken Yeager, Santa Clara County Supervisor for District 4, Cindy Chavez, Santa Clara County Supervisor for District 2, Priya Mathur, CalPERS Board President, as well as many candidates, all publicly expressed their support for union rights. “Today, at the beginning of the Labor Day weekend, we celebrate the contributions of union workers to our communities. Unions represent the last frontier for protecting wages and benefits in this country and I am committed to supporting union rights. We should make it easier to join and form unions,” said Santa Clara County Supervisor Cindy Chavez. Supervisor Cindy Chavez also encouraged everyone to share their #UNION story. This event was also attended by partners and allies who set up booths for the community including Fight for $15, SEIU United Service Workers West (SEIU-USWW), Santa Clara County Democratic Party, Valley Medical Center, Santa Clara County Vector Control, Valley Transportation Agency, Gardner Health Services, and SEIU Latino Caucus. Check out more photos and videos. Hard-working people from Monterey, Santa Cruz, and San Benito Counties rose up and celebrated the vital contributions we make to life on the Central Coast during our community’s Labor Day event. SEIU 521 members were joined by union members from across our community, including Family Child Care Providers who are fighting to have a union and the right to collectively bargain. Jimmy Panetta, Assemblymember Mark Stone, Santa Cruz County District 1 Supervisor John Leopold, Santa Cruz County District 4 Supervisor Greg Caput, Monterey County District 1 Supervisor Luis Alejo, and others. These elected leaders shared their support for working people and our unions, as well as for Family Child Care Providers who are currently fighting for collective bargaining rights. Comments about SEIU 521 Members Reclaimed Labor Day are welcome. Off-topic comments and other violations of our community guidelines may be withheld or removed. Comments do not appear immediately after posting.